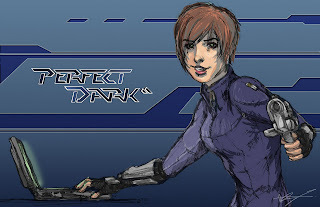 Moragot's Art: Excited for Perfect Dark XBLA! Excited for Perfect Dark XBLA! Perfect Dark was and still is one of the biggest games for me. I remember being extremely excited for this game back in the day. I knew it was going to be great and that the wait was worth it, no matter how many times they pushed it back. When it finally came out I immediately called friends over and we played the night away. From the standard death matches, to creating our own wacky custom games. It was also my first experience with a truly co-operative game. More often then not my memories with this game is at something around 10-15 fps. So it will be quite the treat to be playing this game at a smooth frame rate. Also having a 40" screen to myself will be amazing. Who knows, I may miss sharing a 27", 4:3 screen, sitting around with friends and snacks all in the same room. Here's my little tribute for the game, and one of my favorite game characters of all time. Ms. Joanna Dark.